Metallica’s Kirk Hammett’s guitar straps can now be yours. The idea to create a line of guitar straps was born after a friend of Kirk’s wife’s Lani, veteran leather apprentice Era Balestrieri, made a strap as a gift for Kirk, who was instantly hooked on the comfort and weightlessness of the leather. Lani and Era collaborate on the design of the Kirk Hammett Guitar Straps. A San Francisco native, Era has been the apprentice of leather “Maestro” Ferruccio Serafini in Rome, Italy for nearly ten years. Her work has been featured in the NY Times Style Magazine, Elle Magazine, WWD, The LUXE Guide to Rome, and Italy’s “La Repubblica” newspaper. 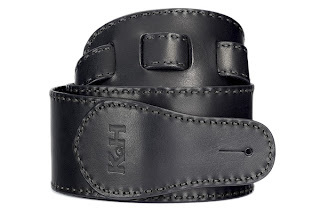 All Kirk Hammett straps are made using leather from the Santa Croce Sull’Arno region in Italy. Known for the high-quality process of natural tanning and drum dyeing, this leather is completely biodegradable and is produced responsibly in association with the regulations established by the Vegetable Tanning Consortium of Italy. The team also use full-grain hides (not to be confused with top-grain, an inferior quality) which is a natural material where slight grain variations and scratches are inherent. These are signs that the hides were not altered in any way. In fact, they highlight the caliber of a leather unmasked by sanding, varnishing, and waxes. Creating a relevant, well-crafted and responsible product is their goal. They make straps from the finest quality materials, starting with vegetable-tanned leather. This leather is why these straps will perform well year after year and only get better with time. No azoic colorings, nickel, chrome or harmful chemicals of any kind are used in the tanning process. These properties make them an ideal strap for those with sensitive skin or allergies to chrome-tanned leather. There are 4 versions to choose from, priced at $195. Players can also go custom by supplying their own design or have the KH team do one up for you at a custom price. Check ‘em out at Kirk Hammett’s website here.